South Mountain is proud – and lucky – to be one of the co-owners of the Amicus Cooperative, a collection of 50 of the most progressive solar companies in the U.S.. Amicus exists to support smaller regional solar companies by leveraging national scale purchasing power, sharing best business practices, and combining collective brainpower. My colleague Rob Meyers, who manages our Energy Services division, never misses their semi-annual gatherings. I have gone twice, once in 2015 in Phoenix and once this year in Denver. It is not an overstatement to say that both times the Amicus group took my breath away. The intelligence, the heart and soul, the culture of civility, humility, humor, inquiry, fellowship, and friendship at these gatherings are extraordinary. 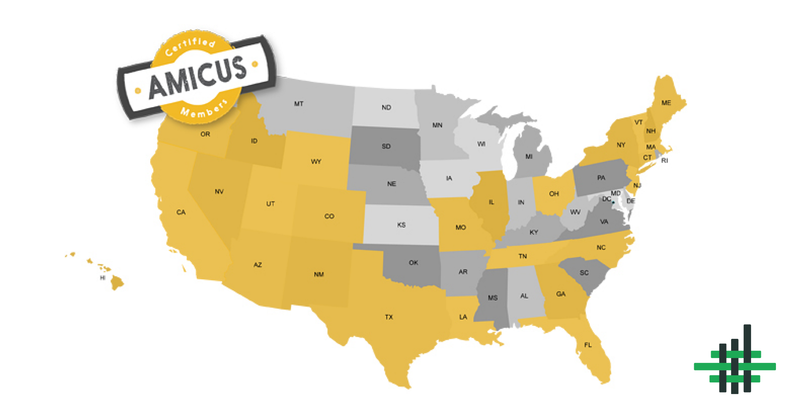 We’re happy to be able to share this piece about Amicus written by Sarah Stranahan, a senior editorial associate at The Democracy Collaborative and a leading member of its Fifty by Fifty employee ownership team. Amicus Solar is one of more than 250 purchasing cooperatives in the US, including such well-known brands as Ace Hardware and Best Western Motels. By forming a large national cooperative, small producers or retailers increase their purchasing power and access to project financing, while remaining independently owned and operated. An additional benefit, it turns out, is that a purchasing co-op can be a particularly effective means of spreading employee ownership. Amicus Solar was founded in 2011 by six independent solar companies, including employee-owned cooperative and certified B Corp Namaste Solar and South Mountain Company. Amicus Solar is led by cooperative veteran and former Namaste Solar employee-owner, Stephen Irvin, who serves as its president. Today Amicus includes 48 local and regional solar photovoltaic (PV) installers and developers who openly share and collaborate on a wide range of business issues, from operational efficiencies to sales and marketing strategies. Similar to Best Western and Ace, Amicus is democratically owned by its members, 40 percent of which are B Corps and a growing number of which are employee owned. With five Amicus members having joined the cooperative as employee-owned companies, Amicus has made a conscious effort to educate its members about worker ownership. As a result, five member businesses (ReVision Energy, Technicians for Sustainability, SunBug Solar, Positive Energy, and Sunlight Solar) have converted — and another five are considering converting — to either become worker coops or employee stock ownership plans (ESOPs). The purchasing co-op has become a means of “industry contagion” — a way of rapidly spreading employee ownership. They are more likely to care about and be accountable to their communities in terms of environmental health, social equity, cultural vitality, and good governance. Localism, however, faces challenges when it comes to economies of scale, which can increase efficiency and reduce the costs of production. Scale is also required to meet the needs of densely populated urban centers, where a larger and larger portion of the world’s population lives. Small solar installers have faced intense competition from large national companies such as SolarCity (recently acquired by Tesla), SunRun, and SunPower. By coming together in a purchasing co-op, the relatively small businesses that own Amicus Solar have leveled the playing field with their larger competitors, particularly in terms of purchasing power, while maintaining the advantages of staying local. In addition to taking advantage of cost and marketing efficiencies, Amicus members share best practices and develop joint strategies to advance their common goals. For example, in 2016 Amicus won a $358,000 grant from the U.S. Department of Energy to found a new cooperative to provide high-quality operations and maintenance (O&M) support to large-scale solar installations. Today Amicus O&M Cooperative includes 20 member organizations that have set collective operations and management standards to ensure that commercial and utility-scale solar PV systems fulfill their performance expectations over the long term. Amicus O&M Cooperative is being led by another cooperative veteran and former Namaste Solar employee-owner, Amanda Bybee. (2) To provide “impact investors” with diversified, impact investment opportunities outside of Wall Street. Kachuwa’s multiple “impact themes” include cooperatives, certified B Corps, and companies that are owned by employees, women, or people of color. Kachuwa itself is aiming to convert to an investment cooperative structure in 2019 and, among other things, to increase its support for companies converting to employee ownership both within the Amicus ecosystem and beyond. Improving access to values-aligned capital is a critically important part to growing the cooperative and employee ownership movements. According to Irvin, president of Amicus, Namaste Solar has had powerful influence on the culture of the purchasing coop and its members. It was at Namaste Solar that Irvin learned about cooperatives, democratic processes and governance, and the importance of facilitating a process to reach consensus. Like Namaste Solar, he says, Amicus uses an open-book management policy to keep everyone fully informed and a committee structure to facilitate decision making. Democratic governance has not only contributed to the purchasing co-op’s success, but has shown members that ownership, mission, governance, and culture matter. Today Amicus Solar is an important driver of employee ownership across an entire industry. I recently attended the Eastern Conference for Workplace Democracy in Worcester MA. Worker co-ops from around the country were represented. As I listened to people relate their struggles to align values with business, it made me think of our good fortune with one aspect of our company: our owners’ equity fund. In 1987 SMCo transitioned from a sole proprietorship to a worker cooperative. Part of the re-structuring was a commitment to profit sharing – we would distribute 35% of annual net profits as cash bonuses to each employee, based on hours worked. The purposes: to share the wealth (of which there wasn’t much at the time) and to partially mitigate our hierarchical wage scale. In addition, our new by-laws called for the distribution of annual dividends to internal capital accounts for each of the co-op owners. Generally, these distributions were (and are to this day) roughly 50% of the remaining net income after profit sharing. The internal capital accounts are paper accounts; they do not have cash in them. They are an obligation – the company owes the money to each owner/employee when that person leaves the company. In September I wrote about a new initiative we are working on called Building Energy Bottom Lines (B-Lines for short). Now it has come to fruition – it’s ready-to-launch. That will occur at the annual Northeast Sustainable Energy Association (NESEA) conference – Building Energy 14 – in Boston in early March. You can read about it here. You can apply for membership there too. I’m pumped up about this new NESEA program. It’s an effort to assemble 30 (for now) of the most progressive and thoughtful architecture, building, and energy companies in the Northeast to share secrets, cross-pollinate, and learn from each other within a rigorous peer group structure.